Just go back from woom of doom. Shots and laser therapy - pain meds and now safely back in his safe place sleeping it off. Sigh. At least this time I knew what to expect how to treat it and was prepared! Had him diagnosed before i even got there! My poor man.. He looks soooo much like his daddy, Hershey now. Good side - his weight was great! Sandi aka Mama S aka keeper of da herd and da Popsicle flavor list AND Nana to Sean, Mykaylyn, Emma, Baylee, Eli, and Bryce and Mama to da brat, da boy and Brooke! Sending oodles of rayz to baby Sam!! Please keep us posted on his progress. We miss you around here, Mama S! Yes to what Lisa said! I don’t check in as often as I should, often popping in to make sure Patrice is kept up to date... but we miss you. 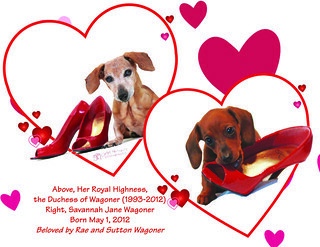 Her Royal Highness, the Duchess of Wagoner 1993-2012. I"m so sorry about Sam. Sending tons of for both of you. Tons of back , Mama! At least you know what's going on with the poor old man, and how to deal with it! Please keep us posted, ok? yup, it's lonely around here. I still check in at least once or twice a day, but it's pretty quiet. I miss us. "The greatest of all mistakes is to do nothing because you can only do a little. Do what you can." for the man and you. Laser worked really well for my crew. I hope you see some improvement soon. Sharing home with Sebastian and Sofie.